Gremlins Christmas Sweater | Nerd Much? As the saying goes, once October goes around, it’s basically Christmas. There’s no holiday that we nerd out more over than Christmas, as it means there will not only be a never ending stream of Christmas movies on TV, but also tons of great new nerdy Christmas stuff, including decorations, ornaments, and ugly Christmas sweaters. Our latest holiday find is this Gremlins Christmas Sweater by Middle of Beyond (MOB), a not-so-beautifully-knit Gremlins-themed sweater that’ll be perfect for your office holiday party later this year. The Gremlins Christmas Sweater is, of course, officially licensed and based on the 1984 Gremlins movie starring Zach Galligan and Phoebe Cates. It features both the adorable Gremlin and their green monster counterparts. It also has snowflakes and Christmas trees, as well as a Santa hat-wearing Gremlin on the front. Please make sure you don’t eat anything after midnight while you’re wearing it, just in case. Of course, this is just one of the many INCREDIBLE ugly holiday sweaters that MOB has on their site, including an alien nativity sweater, Cthulhu Lovecraft sweater, and a cyborg Santa sweater. 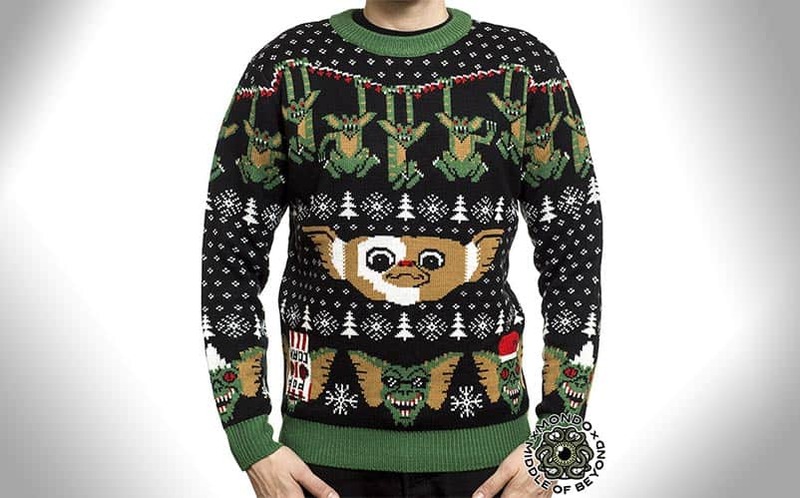 Buy the Gremlins Christmas Sweater here. For more ridiculously cool nerdy things, stay tuned to Nerdmuch.com for daily finds. We also already have a massive list of nerdy ugly Christmas sweaters for you to blow your rent money on. You can also feed our ego on Twitter if you’d like.